The newest Mansion Casino ‘We’re ready to play, are you?’ campaign with Sherbet Media. 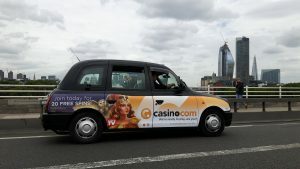 This past season we were delighted to showcase stunning Mansion Casino Supersides on our Sherbet taxis. Sherbet & Mansion Casino colourful taxis were turning heads on the streets of London raising awareness of the brand and its newest offer amongst large and diverse audience of millions. 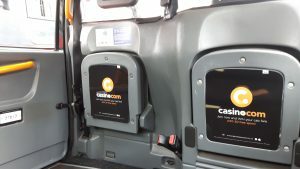 As well as providing coverage outside the taxi, Sherbet Media interior advertising reached those travelling on board the taxis through branded tip seats and receipts pads. 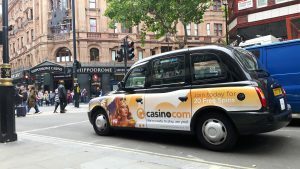 As Mansion Casino states: ‘At Casino.com, anything can happen!’ campaign creative concept sparks excitement and anticipation within its audience. 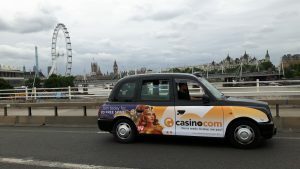 Commenting on the UK campaign, Mansion marketing detailed that it wanted to create an authentic feel and message for its relaunch of Casino.com, one of the oldest online gambling brands.